The first time we see Sandra Bya (a frankly never better Marion Cotillard), the reluctant, frazzled heroine of Jean-Pierre and Luc Dardenne’s working class drama, Two Days, One Night, she is lying on her side half asleep. Her cell phone buzzes offscreen, vying for her attention like a needy child. Its best efforts to rouse her do not appear to be working. Finally though, Sandra manages to stand. She groggily pulls herself from the bed to answer the call and remove some half-forgotten food from the oven. Sandra will soon learn from her friend, Juliette, that she is being let go from her job at the local solar plant, but this beautiful, young woman’s demeanor is frail, stooped and defeated before she even receives the news. Sandra has been in this feeble state since six months ago, when she experienced a nervous breakdown and took a sabbatical from her job. After learning that the plant could function without her, Sandra’s boss, Mr. Dumont, gave her 16 coworkers the option of either keeping Sandra or taking home a $1,000 bonus. 14 out of 16 decided they would rather keep the money. Sandra acquiesces to defeat almost as soon as she hangs up the phone. She begs herself not to cry and takes a couple of Xanax, ready to sleep the weekend away and meet her sorry fate on Monday. It seems all hope is lost until her husband, Manu, returns home with a silver lining. He has spoken to Juliette, who learned that Jean-Marc, the factory foreman, intimidated the other workers by falsely implying that one of them would be laid off if it were not Sandra. The choice Sandra’s co-workers thought they were voting for was not to get a bonus or keep Sandra, but rather to get a bonus or potentially lose their own jobs. Sandra, Manu, and their two children have great need of her income, but Sandra’s depleted physical and mental condition has left her in a poor position to fight a battle of this magnitude. Nonetheless, she is just barely able to summon the strength to go down to the plant and explain the situation to Mr. Dumont. Juliette actually does most of the talking for her, as Sandra stands meekly to the side, unsure if she even wants to be there; unsure any small sliver of hope she might have is worth the strain on her psyche. Sandra is being held up on invisible strings by her devoted friend and indefatigable husband, but it is enough to give pause to Mr. Dumont, who wants to avoid any suggestion of impropriety. He agrees to hold a revote on Monday, with a majority needed to overturn the decision. Juliette and Manu are relieved for her, but Sandra looks like she just wants to be back under her refuge of blankets. She is content to wait until Monday to see how the vote turns out. Manu prods and coaxes her into speaking personally with her 16 co-workers. The hope is that seeing the human cost of their decision will move them to change their minds. More importantly, Manu wants Sandra to reengage with a world that she no longer feels capable of even looking in the eye. 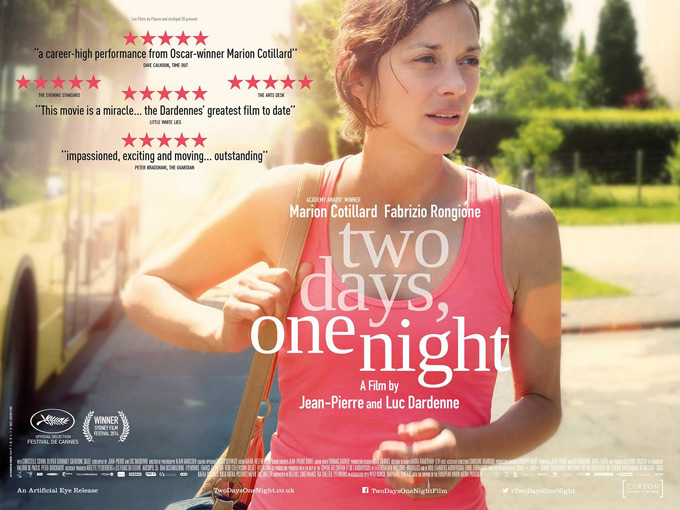 Two Days, One Night is a film of both deeply felt emotion and remarkable economy. In the first 10 minutes, the Dardenne brothers, Belgian masters of beautifully minimalist storytelling, introduce a flawed, relatable character and her two closest allies, fill us in on her backstory and her most damaging character flaw, and set up the entire conflict that will unfold over the next 90 minutes. What follows could have been a drab and preachy slice of social realism, forcing us to watch a mentally ill woman unravel in the face of redundancy and become a martyr of today’s unforgiving economic conditions, but Two Days, One Night is one of the most unexpectedly joyous films of the year. As with any film by the Dardenne brothers, it is certainly a proud example of social realism, but it never sinks into a quagmire of pessimism. 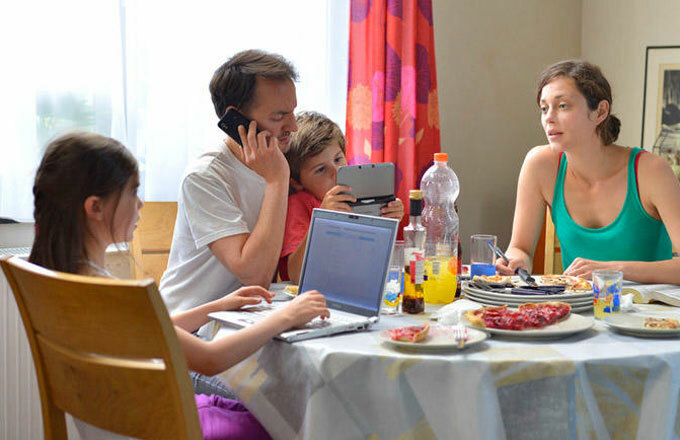 In the same way that Manu and Juliette continually nudge Sandra away from her anxiety and self-pity, the Dardenne brothers take a film about the plight of the working class and push it in the direction of optimism, solidarity, and courage in the face of life’s hardships. In this regard, the arc of the film mirrors the arc of its character, who starts enshrouded in a deep malaise and never seems more than two seconds from collapsing in a heap, but who learns to find her footing through the help of her family and close friend, through allies she never knew she had, and finally on her own initiative. The two days and one night of the title are the amount of time that Sandra has in which to change the minds of 7 of the remaining 14 coworkers. In following her through each of these 14 encounters, Two Days, One Night crafts a rich tapestry of human beings, each giving a unique slant on the battle between generosity and self-interest in the human soul. Sandra gets a bit of misleading hope at the start of her first day when one coworker not only says he will change his vote, but does so over the phone. The Dardennes and the great Marion Cotillard have a deep psychological understanding of Sandra, who is a smart, resourceful woman under the best of circumstances, but initially has trouble standing fully erect when life rains down in sheets. We all cling to the outside hope that life will not only blithely give us the answer we want, but that it will do so without asking us to walk out of our own front door. Naturally, adversity soon rears its head. She vistis the homes of her next two coworkers, who apologetically explain that their financial situations are too dire for them to reject the bonus out of loyalty to her. One is sending his daughter to college, the other starting a new life after a divorce. Sandra does her best to put on a brave face, but these early moments of rejection send her just as quickly back into her tailspin, scrambling for pills and pining for her bed. “I don’t even exist,” she laments. Manu must remind her that she does and that she must stand and fight, not close her eyes and slump. After a particularly bitter rejection, he shuts off the radio to protect her from hearing a sad song at the wrong time. Showing a heretofore unseen strength, Sandra turns it back on. She may not be in ideal state to meet this arduous task, but she is striving mightily to face the music. Remarkably and blessedly, Two Days, One Night is not the story of a fragile woman whose kind, sturdy husband teaches her to fight for her job and her self-actualization. Even if that were its intent, Marion Cotillard’s slow, halting climb out of the depths of self-pity and dejection is too vital, beautiful, and wholly convincing to let Sandra become a secondary character in her own working class hero’s journey, even when she is at her most downtrodden and despondent. Moreover, Cotillard is not alone in believing in Sandra, because the Dardennes are squarely in her corner too. They are wholly entranced and moved by both the lows of her melancholic vulnerability and the heights of her rekindled agency. I have talked at length of Sandra’s initial frailty, but this is no portrait of a weak, floundering woman. This is quite honestly one of the most wonderfully strong, fantastically faltering, and naturally empathetic characters to come around in a long time. Cotillard and the Dardennes have created for Sandra a narrative of slow, painful growth so natural and cathartic that our hearts positively soar for her, when they are not breaking. And they have done it all under the banner of an unadorned social realist drama about working class redundancy. Two Days, One Night is a painful, hopeful, occasionally even funny reminder of how conflict can destroy or rejuvenate us, with a vibrant, achingly human character staring down both roads, often simultaneously. It was one of the year’s great pleasures to travel with her as she reluctantly, then tentatively, and then confidently went out to meet her fellow human. While the Dardennes provide Sandra with a very moving, even inspirational narrative path, there is nothing pat about it. As surely as the film deftly sidesteps bleak miserablism, the film is not interested in portraying Sandra’s journey as one from adversity into perpetual sunlight. This is a story of empowerment, but it is not the story of a woman shaking off her mental illness for good and all, as no responsible story about depression should be. I will pass on this easy opportunity to pile on Silver Linings Playbook, a film I do like quite a bit. But I will say that the Dardennes have created a film that is neither a miserable, defeatist slog, nor a myopically cheerful tale of self-belief paving over mental illness and human frailty. Sandra seems to suffer from depression from the start of the film, and the film never suggests that she has broken free of that completely. What she has learned is the value of fighting to assert her dignity and identity. Two Days, One Night has a number of themes, and one of the major ones is the notion of struggle. What makes it such an unexpectedly exuberant and lovely piece of working class social realism is that it acknowledges that struggle is ongoing, but argues that it need not only be a source of strife. It can also be a wellspring of purpose, satisfaction, and even real joy. More than that, it can be a source of solidarity. On second viewing, what emerged most clearly was how much Two Days, One Night is the story of how we are never alone, even in our darkest trials. Sandra asks each coworker to reflect upon her situation with empathy, and she encounters a wide range of reactions to that request. Some agree reluctantly to help her, some meekly decline, some respond with anger that she has asked them to make such a tough decision. Regardless of how each new worker responds, the more of them Sandra meets, the harder it is for her to want to go back to sleep. Two Days, One Night is a work of naturalistic neorealism in the way it paints a working class tableau out of a vast ensemble of non-professional actors. But, instead of using neorealism solely to observe lower class oppression and economic hardship, it weaves a teeming, lived-in world of persons. It does so just to remind us that there are so many faces we have still not gazed into, and could if we only knocked upon their door. Just as Sandra does with her coworkers, Two Days, One Night asks us to look to the person next to us and to consider their situation. Each one of them could be the person who saves our lives, or the person that we save. In the span of hours, someone who was only a passing acquaintance could be a new traveling companion, sitting beside us in the car, belting out “G-L-O-R-i-A!” on the radio. What a difference a day makes. To watch Sandra is not only to dwell on how hard it is to break the inertia of sadness and fatigue, but also to remember how contagious it can be to remember that we are alive and surrounded by people just as flawed and frail as we are. In perhaps the film’s most moving moment, Sandra interrupts a coworker at his soccer practice, and is utterly taken aback by his emotional response. He weeps, he begs her forgiveness, and he smilingly recalls a time when she stood up for him at work. When we forget to value ourselves, we also forget to consider how valued we are by those around us. Sandra walks away from the encounter beaming like the sunshine. Life presents so many opportunities for loss, but the possibility for gain is just as ever-present. We may lose our money, our spouses, our jobs. We stand to gain a community.